And the prospect of defeat takes on a whole new meaning for governments who don't have majorities. In other times, it's not that unusual for governments to lose votes on amendments, take stock and then alter their legislation. It's part of the system, however messy it gets. But Theresa May's government, without a majority of its own, has been marked by trying to avoid defeat in the Commons by folding, budging, or making new promises to avoid losing actual votes (caveat - the government has lost opposition day debates, when they have refused to vote at all, but it's a very different picture on getting their own business done). For vulnerable governments, to lose is potentially much more dangerous than the odd defeat for governments who are secure in the level of their support. It's in that context that the government faces a potential defeat on Wednesday on the Withdrawal Bill and must weigh up its best course of action. The legislation has been grinding its way through the Commons for weeks. Tory rebels have threatened to vote against the government on a few different occasions. 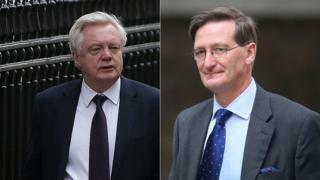 This time however, with the rebellion led by one of the most unlikely troublemakers, the former Attorney General Dominic Grieve, they really do mean business. And while the government today has sought to say ministers are listening, government sources say they are looking to do what they can to make peace - as things stand tonight, it's feasible that the prime minister will be beaten in the Commons tomorrow night. Yes, a possible defeat on the eve of the European Council. The dispute (for once!) is pretty simple. A group of Tories, including former ministers and lawyers, are demanding a legal guarantee that MPs have a chance to vote on the terms of the final Brexit deal before we leave, what they say is a vital piece of democratic oversight. Yes, the government has already promised MPs a vote, but the rebels and the opposition parties want the promise to be enshrined in law as soon as possible. The government has already conceded the principle, they say, given that there is going to be another bill (yes another one) relating to the final deal. But for now, ministers, who are listening, and the government whips frantically trying to talk the rebels down, don't want to budge or give up their resistance to the proposed change. Meanwhile Labour is pushing the Tory rebels finally to walk the walk, not just talk the talk. The role of Labour's small band of Brexiteers will be vital too. There are suggestions that for a couple of them, the temptation to defeat the government could override their consistent positions of voting with the government on Brexit. And the sums are so finally balanced every vote will count. One of the leading rebels said "it really may come down to the twos or threes". A ministerial statement is expected in the morning that could contain more concessions to the rebels, or at least restate and package up the guarantees the government has already put forward. The situation could change rapidly, with another potential rebellion melting away. But the government may well have to budge, again, if they want to avoid defeat. It might have to be Theresa May and her ministerial team who blink this time.